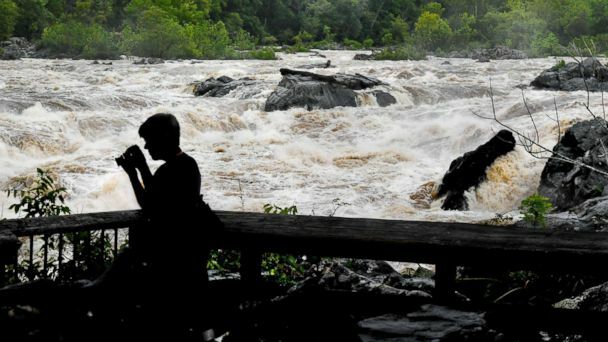 A man trying to take a selfie near the flooded Potomac River in Maryland fell into the rushing waters and seriously injured himself, a local official said. It appeared the man accidentally got too close to the rapidly moving river on Sunday evening and slipped, Montgomery County Fire and Rescue Service spokesman Pete Piringer told ABC News. As rescuers were en route to help, the man was pulled out of the water by passersbys, Piringer said. The man suffered "pretty significant traumatic injuries" to his leg, Piringer said, and was hospitalized in serious, but non-life-threatening condition. The Potomac River has been especially high and extremely dangerous lately, Piringer warned. The river is under a flood warning in the Great Falls area and was above flood stage on Sunday. "Swimming is prohibited in this area of the Potomac River," he said. "So we're constantly warning people to stay away from the water -- it's dangerous." This wasn't the only recent selfie attempt to take a dangerous turn. In September, an 18-year-old hiker died after falling off a cliff at Yosemite National Park, according to the National Park Service. The teen's mother told The Times of Israel that he slipped while trying to take a selfie at the edge of Nevada Fall.